Blog with interesting cases and/or problems related to anesthesia with discussion based on best evidence in the literature. This is a case of an elderly gentleman who had been diagnosed with chronic lymphocytic leukemia. He also suffered from COPD, hypothyroidism, hypertension, anemia and an Ataxia. The family requsted that a spinal anesthetic be performed due to the patient's poor lung condition. However, a review of the labs revealed that his platelet count was only 72,000. He had also received a dose of lovenox to prevent DVT formation. Therefore, A GETA was chosen for intraoperative care. The highlights of this case are the issues surrounding CLL and how they might impact on anesthesia, as well as good options for pain control in this 89 year old patient who was in significant pain but suffered from poor mental status and COPD. The definition of CLL is a monoclonoal B cell lymphocytosis (MBL) of greather than 5000/mm3 for greater than 3 months, which co-express CD5, CD19, CD20, and CD23. In many cases this form of leukemia progresses slowly and therefore, treatment is not indicated in early stages. There are however, certain genetic subtypes that are more agressive and associated with low survival after 1 year. An important aspect of this disease to consider when dealing with a patient in the perioperative period is appreciating the elevated potential infection risk for these patients. As the lymphocytes that are produced are immature and have very few monoclonoal gamma globulins expressed on the cell membrane surface, these patients have an increased infection risk from breaches of the skin barrier. Patients can develop hypogammaglobulinemia and imparied T cell function. If repeated infections occur in these patients, they will be treated with monthly parenteral IVIG. A careful history of recent or repeated infections should be illicited from the patient to determine their level of risk from infection during the perioperative period. If invasive vascular procedures or blocks are contemplated, consideration of this risk should be evaluated. In patients that have more advanced disease there is invasion of the bone marrow and hepatosplenomegaly. In these patients anemia and thrombocytopenia will be present. This results from more than simple bone marrow invasion of B cell proliferation. Splenomegaly can result in splenic sequestration (which may necessitate splenectomy) of platelests and RBCs. There is also an increased incidence of autoimmune hemolytic anemia (AIHA) in CLL patients where the direct antiglobulin test (DAT) can predict the development of this problem in most patients. Anemia that is a result of AIHA will result in a particular set of lab values: Low Hgb, increased retic count, increased LDH, decreased haptoglobin, increased bilirubin. Pure red cell aplasia (PRCA) while rare can occurr and can result in severe anemia. Autoimmune thrombocytopenia may also result (2-3%). ITP in CLL is rare, but thrombocytopenia is not rare in CLL. Bone marrow infiltration (myelophthisis), is the more common cause as well as secondary effects from certain chemotherapeutic agents the patient may be taking. Finally, less commonly, agranulocytosis can develop. While the WBC on the CBC usually doesn't garner as much attention as the Hgb or Platelet count by the anesthesiologist, in the case of leukemia, a heightened sense of concern for severe eleveation of luekocytes is important. In some cases, very high levels of WBCs can occurr (more than 400,000/microL) which will result in a sludgey highly viscous blood. This is considered a medical emergency and non emergenct surgery should be delayed. Symptoms are rare even with very high WBCs, so a careful review of labs is required. The treatment of CLL includes steroids in all phases and severities. Therefore, careful consideration should be given to steroid replacement in the operative period. In the early phase of treatment, high dose steroids are used which result in an immunocompromised patient. Patients being treated for AIHA often require high doses of Folic Acid due to high cell turnover, making prolonged to Nitrous Oxide a dubious choice for anesthesia. In this patient with COPD, a spinal block for intraoperative anesthesia would have been ideal given his diminished neurological state and COPD. Unfortunately, his low platelet count and recent dose of enoxeparin contraindicated a spinal. Therefore, GETA was performed. However, it was desired by the family that we provide an alternative to narcotics for post operative pain control. Given the fragile state of the patient, repositioning for a lumbar plexus block was not desirable. Furthermore, given the coagulation status of the patient, a lumbar plexus block would carry increased risk. Therefore, an ultrasound guided fascia iliaca block was chosen. The advantages of this block include: Safe when using US guidance, is located superficially and thus is compressible should bleeding occur, and can be performed in the supine position. While this is a block that has been around for years, concerns of safety have resulted in its underutilization. However, with US guidance, direct visualization of the needle allows for clinicians to avoid intraperitoneal placement of the needle as well as increasing the success of the block. After the surgery the patient was brought to the PACU. In the supine position, a brief initial scan was performed to visualize the landmarks. First, the anterior superior iliac spine was located (ASIC) with the US probe after which it was moved medially along the inguinal ligament. The probe was maintained in a nearly perpendicuclar position to the inguinal ligament. As it was moved medially, the iliam was visualized easily as it appears as a dense image with US. Overlying this pelvic bone lies the iliacus muscle. The important structure is the fascia that covers the iliacus and provides a potential space for spread of LA solution superiorly back to the lumbar plexus. 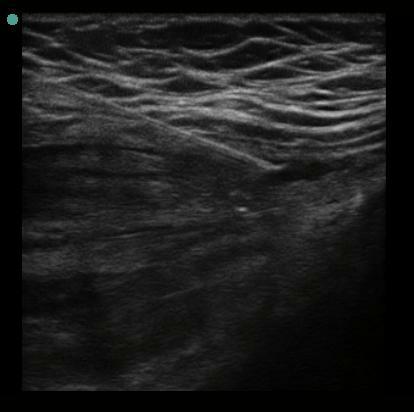 Because spread along the fascial plane is necessary for blockade of the lumbar plexus, a large volume injection is best. In this case I chose 0.2% ropivacaine at 50 mL. After a careful sterile prep of the area, a 22G 8cm blunt tip style needle was used and visualized as it approached the fascial plane. 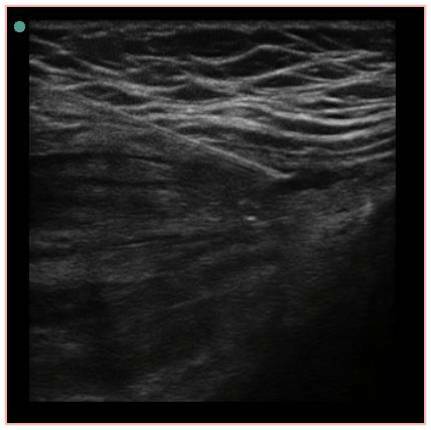 As the tip approaches the fascial layer sensing and visualizing a distinct "pop" as the needle tip passes through the fascial plane assures the clinician that the LA will be injected into the proper place. It is important to inject the LA close to the surface of the muscle-fascia interface so as to maximize the potential for spread back up towards the lumbar plexus. This can be visualized on the US and compression distally may be helpful to aid proper proximal spread. The technical aspects of this is well described at neuraxiom.com. In hip fracture surgery, there is some evidence that we should all strive to provide regional anesthesia options as much as possible. A cochrane review showed reduced short term survival in patients who had GA vs. regional for hip fracture surgery, but an update of this meta-analysis in 2004 was unable to reach the same conclusion, although they did show that acute post operative confusion was reduced in patients who received regional anesthesia . Indeed, this patient population is at higher risk for post operative delirium. This condition is associated with prolonged hospitalization. Therefore, it would be prudent to avoid this complication. A 2009 study found that the incidence of delirium and its duration could be reduced in patients given a fascia iliaca block vs. traditional opioid pain control after hip fracture surgery . In a slightly different patient population (THA), regional anesthesia (RA) vs. GA did not improve any hard outcomes (mortality, cardiopulmonary morbidity, rehabilitation or LOS) based on a meta analysis . After the injection, the patient was transported to his room. Three hours later a visit to the patient found him sitting in a chair and having 1/10 pain (no pain in the surgical hip). 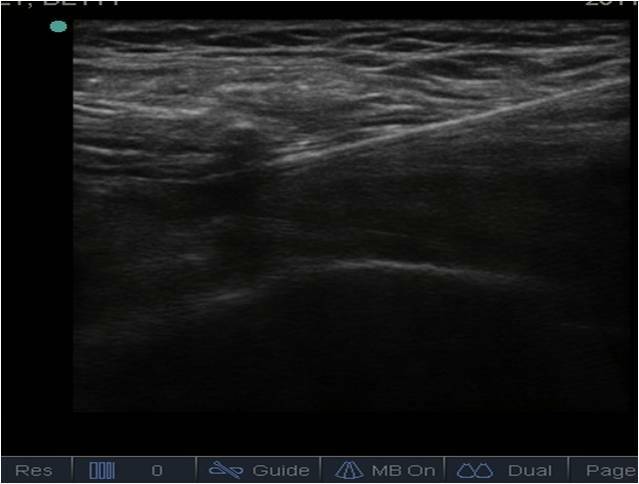 He was unable to lift the leg on the side of the block demonstrating a motor block although 0.2% ropivacaine was used. In conclusion, hip fracture patients tend to be debilitated, older, and have multiple medical conditions that put them at higher risk for the developement of iatrogenic pneumonia, delirium or other adverse effects from opioid pain medications after hip surgery. Utilizing LA injections is beneficial. 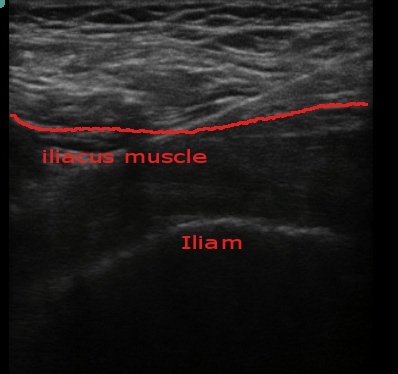 Mastery of the fascia iliaca block allows excellent treatment of pain in the anticoagulated, supine restricted, and frail patient who present for hip fracture repair which is done in the supine position.